The HubSpot tracking code helps you monitor your website's traffic. The tracking code is automatically included on HubSpot pages; however, if you have pages on your website that are not hosted on HubSpot, you must install the HubSpot tracking code to capture analytics for those pages. You should not install multiple HubSpot tracking codes on a page. If there are multiple HubSpot tracking codes installed, the first one to load on the page will fire; any subsequent HubSpot tracking codes will not work. If your IT admin or web developer is installing the code, they must have a HubSpot user account. If you're using a single-page application, refer to the developers documentation to set up tracking. If you're hosting entire domains or subdomains externally, you must also add your domain(s) and/or subdomain(s) to your settings in HubSpot. The tracking code is not supported on AMP sites. Follow the steps here to install your tracking code. If you have already installed the tracking code, learn how to verify installation and troubleshoot. In the left sidebar menu, navigate to Reports > Tracking Code. Below the Embed code section, click Copy or click Email to my web developer to send the tracking code to the team member who will be installing it on your site. Click Install HubSpot on your website. In the right panel, select No, then click Next. Click Copy to copy the tracking code. Please note: if you are using Wordpress, select Yes, and then click Next, to access a link to install the Contact Form Builder for WordPress – Conversion Tools by HubSpot plugin. In the upper right, click the Actions dropdown menu and select View tracking code. In the dialog box, click Copy. Please note: the tracking code is different for every HubSpot account; you must copy the code directly from your account. Paste the code immediately before the closing </body> tag in the HTML code for each page of your site. You can then test your HubSpot tracking code to verify it is working. Please note: if you're using WordPress, you can opt to install the Contact Form Builder for WordPress – Conversion Tools by HubSpot plugin instead of following the WordPress instructions in this article. Please note: because every website/CMS is structured differently, these steps may not be the exact instructions on how to access your HTML code. If you're not sure how to access the HTML code of your site, send this article to your webmaster, IT department, or technical resource. 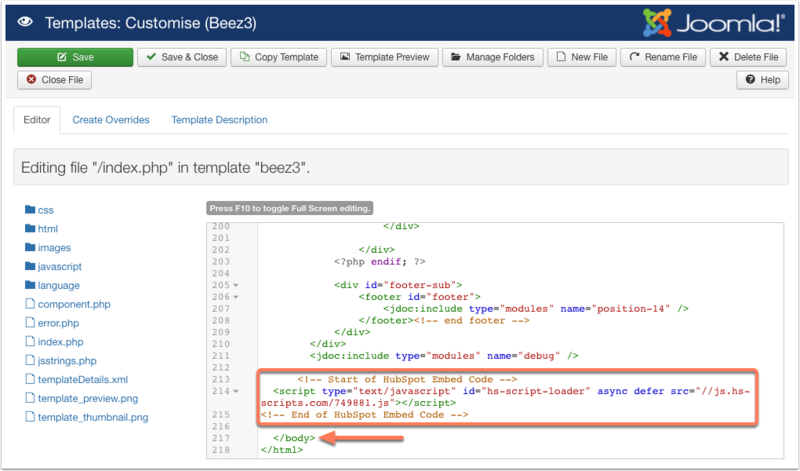 Most content management systems and IT departments can deploy a piece of code to all pages on your site, such as a footer file that is referenced across all pages. While it is recommended that you use the Contact Form Builder for WordPress - Conversion Tools by HubSpot plugin, you can also install the tracking code manually. 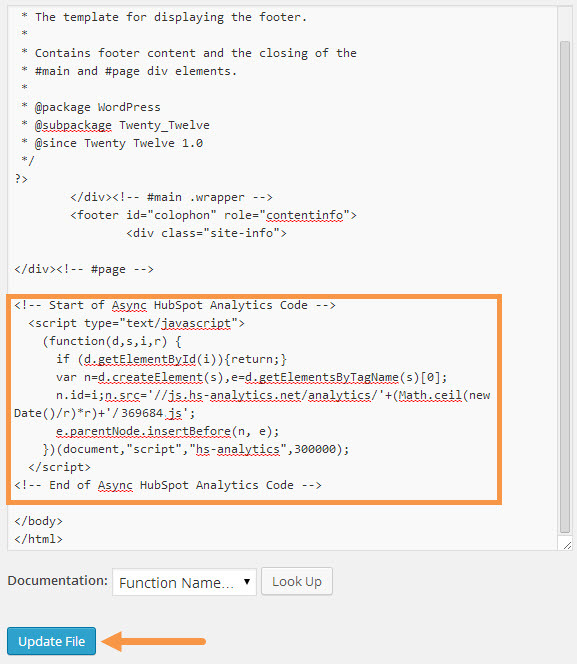 If you manually add the tracking code and have a HubSpot Marketing Hub Basic, Professional, or Enterprise account, HubSpot will not be able to differentiate WordPress posts versus pages in analytics. Follow the steps above to copy the HubSpot tracking code in your HubSpot account. In the left sidebar menu, navigate to Appearance > Editor. In the list of theme files on the right side of the editor, select Footer. Paste in the tracking code and select Update File. Please note: if you're using the Shopify integration, you don't need to install the tracking code separately. Log in to your Shopify admin dashboard. In the left sidebar menu, navigate to Online Store > Themes. Click the Actions dropdown menu and select Edit code. 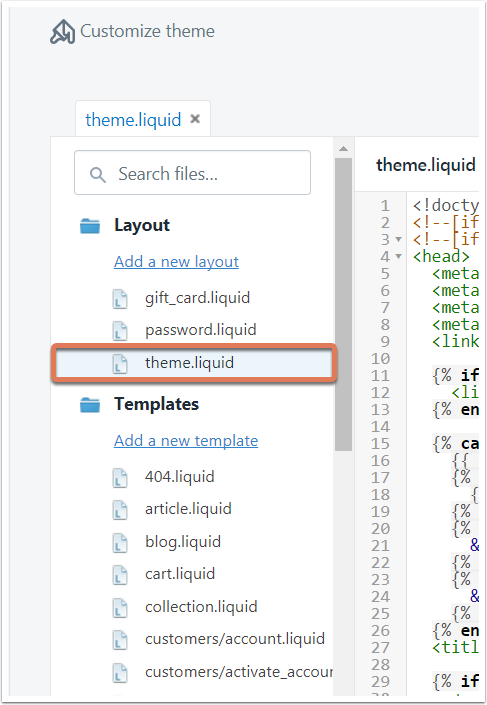 Select the theme.liquid file for your theme. 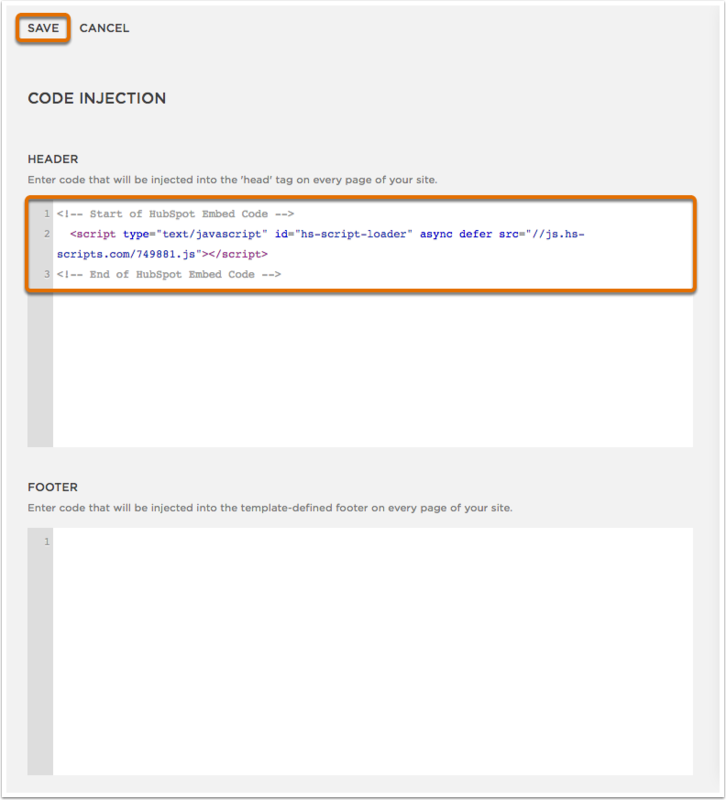 Paste your HubSpot tracking code just before the </body> tag in this file. Log in to your Drupal admin dashboard. 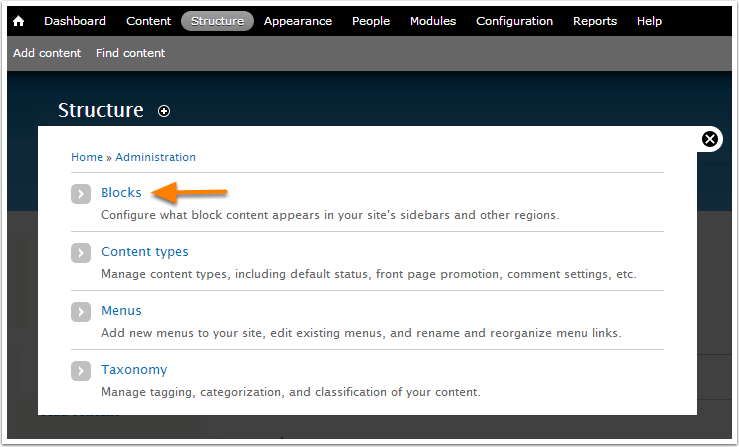 In the main navigation menu, navigate to Structure. Enter the fields for your new block. Paste the tracking code in the Block body field, and then click Save block. Navigate to your Site Manager. In the left sidebar menu, navigate to Tracking and Analytics. Click Custom or Add new tool > Custom. Paste the tracking code in the Paste code snippet here field. Set the Name of the new tool to HubSpot Tracking Code. Under Add Code to Pages click the radio button for All pages and use the dropdown menu to select Load code on each new page. Under Place Code in section, click the radio button for the Body - end option. There are two ways to add your HubSpot tracking code to your Joomla site. With either method, you'll first need to copy your HubSpot tracking code following the steps above. Log in to your Joomla account as an administrator. In the main navigation menu, navigate to Extensions > Templates > Templates. Click the name of your template and select index.php in the left sidebar menu. 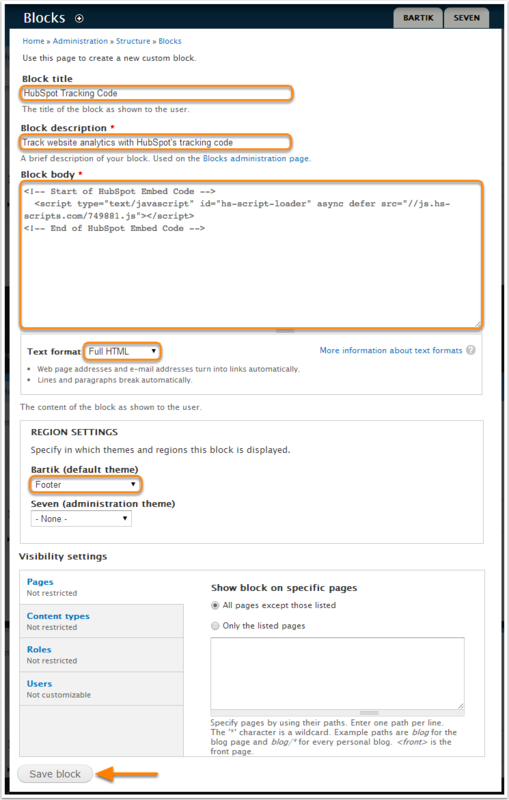 Paste the HubSpot tracking code directly above the </body> tag. Log in to your Squarespace account. In the left sidebar menu, navigate to Settings. In the Website section of the menu, navigate to Advanced, then select Code Injection. Paste the tracking code into the Header field. In the upper left, click Save. In a new browser tab or window, log in to your Google Tag Manager account. In the left sidebar menu, navigate to Tags. For the Tag type, choose Custom HTML Tag. Then, give your tag a name. Paste the tracking code in the HTML field. Below Tag Configuration, click Triggering to set up a firing rule. If you don't set up a firing rule, the tag will not fire and HubSpot analytics data will not be collected. For the tag to fire on all pages with the Google Tag Manager code installed (recommended), select the option for All Pages. Click Save to save your new tag. In the upper right, click Publish to save your container and tags. If you haven't already done so, install Google Tag Manager on your website.